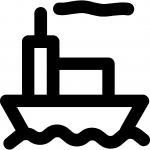 Freightbrain International Ltd can offer a range of Sea freight services, whether this be a small carton or a full container. Unsure of how to go about importing? Give us a call, we can guide you through the shipping process from start to finish, giving you the time and information you need to successfully import from or export to new markets. We are able to offer services on all the major shipping lines throughout the world and are not “tied-in” to any one Line, who’s service level might deteriorate or rates become uncompetitive. We work closely with our importers to find the right service for them and will spot-rate and shop the market giving due consideration to freight rate, space availability and transit time. No matter what the terms of sale are Incoterms-FBI, whether it be Ex-Works, FOB or CIF – Freightbrain International are able to handle all aspects of shipping your goods. We can progress chase your orders via our agents with the overseas factory in their own language – alerting you to any potential delays in manufacture. We can ensure that all the correct paperwork is in place for both import and export including rapid issuance of Bills of Lading once shipped on board. If you are buying FOB or Ex-Works or even C&F, it is important to remember about Marine Insurance cover for your goods. This is one area where people often “take a chance” which might be justified on very small value shipments but on larger values it is always advisable to consider marine cover for your goods. We have our own open cover which is available to all our customers and gives that extra level of protection and peace of mind. Buying from China or the Far East? Speak to us first before allowing shippers “to arrange the shipping” – there are some unpleasant games being played out there. Don’t get caught with inflated arrival charges. Have you ever heard of CISF? or Perhaps “ROE Surcharge” or various other charges. FBI Chinese Burns read more.